It was the wrong venue. A major new music service, announced at a developer's conference? 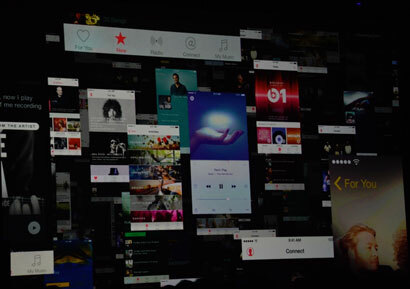 WWDC is a big deal these days, perfect for announcing new versions of OS X and IOS and watchOS, but incredibly wrong for Apple Music. It should not have been a "one more thing" at a dev conference, no way. Beats 1 Radio makes no sense. So ... the future of music is a single station we all listen to, all the time. Riiight. This is exactly backward, the future of music is a million personalized stations. 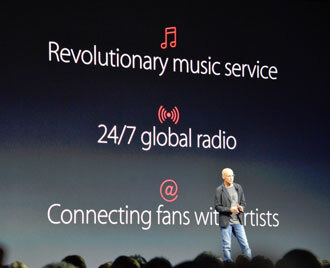 In fact, it's already the present of music, as presented via Spotify and Rdio and Pandora and Slacker and all the rest. Music curation by experts? Bsssst, fail. Okay I get the argument in favor of people over algorithms, but not experts over friends. (And I say this as a lifelong Jim Ladd fan). Actually Apple have traditionally been on the side of algorithms anyway, Genius, etc. Felt retrograde. Connect aka Ping 2.0? Yawn. This feels like Apple getting desperate. They just do not understand social networking, and should not try. Everyone already belongs to Facebook and Twitter (and Instagram). Nobody wants or needs a fourth network. They should have integrated with what is already there. The lessons of Ping (and Google+) were not understood. [Added] The dog that didn't bark: artist royalties. The biggest challenge in the music industry - and one which has been exacerbated by subscription services like Spotify - is how to share the wealth back to the artists, especially those further down the long tail. How are they to be discovered? How can they get paid? Apple was silent on these issues, which should have been taken head on. Remember, iTunes saved musicians from Napster. Worst of all, the whole thing felt like a mishmash. Not cleanly organized or communicated*. Clearly a big push-pull between Apple and Beats execs. Yeah Drake and Weeknd are cool, but where's the "there" here? Confusion breeds indifference. I'm clicking away already. This slide says it all: three old things trying to be one new thing. And the Apple of today trying to be the Apple of 2007 (iPhone). In fact, trying to be the Apple of 2001 (iTunes). My biggest takeaway is that this calls the entire Beats acquisition into question. I didn't understand it at the time, and now that we see where it went, we can see it was a mistake. It was Tim Cook and Eddie Cue trying to be cool by hanging with Jimmy Iovine and Dr. Dre, and failing. Everyone involved has lost cred. I predict the execs at Spotify, Rdio, and Pandora are celebrating. They must have feared Apple's entry into their space, and they must be relieved that it was so weak. PS I will consider the other parts of Apple's announcements shortly, stay tuned. For a great recap, I recommend the Verge liveblog, which is not only informative but funny. High line: biggest news was open-sourcing Swift. First time I have thought that maybe I will want to / have to learn it.